The White House has said it will press ahead with efforts to confirm the US envoy to the UN, John Bolton, in the newly Democrat-held Senate. White House spokesman Tony Snow described Mr Bolton's record in his current post as "terrific". But the chances of Mr Bolton being backed by the Senate are slim after the Democrats' victory in mid-term polls, correspondents say. This means that Mr Bolton will probably be replaced in January, they say. He would become the second high-profile member of President George W Bush's team to leave after the 7 November polls, following Defence Secretary Donald Rumsfeld. 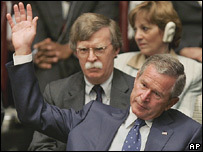 Mr Bolton was appointed to the UN post in August 2005 during a Congressional recess after his nomination stalled in the Senate. The move was a procedural manoeuvre that avoided the need for him to be confirmed until the end of this year. That procedure cannot be repeated, and the new climate in Congress appears to rule out him winning a two-thirds majority of senators. But the senators who opposed Mr Bolton last time, including one Republican, are refusing to change their minds. Lincoln Chafee, who was defeated by his Democrat rival in Rhode Island this week, said it would be illogical to change his stance at the last minute. "The American people have spoken out against the president's agenda on a number of fronts, and presumably one of those fronts is on foreign policy," Mr Chafee said. "And at this late stage in my term, I'm not going to endorse something the American people have spoken out against." At the state department, a spokesman defended Mr Bolton, describing his work at the UN as "extraordinarily effective". "Now is not the time to have a gap in your UN ambassador," Sean McCormack said, referring to the current impasse over North Korea's nuclear test and other issues. But with the Democrats due to take over in January, the door has slammed shut, says the BBC's Justin Webb in Washington. Senior Democrat Joseph Biden said: "I see no point in considering Mr Bolton's nomination again in the Foreign Relations Committee because regardless of what happens there, he is unlikely to be considered by the full Senate." Following a meeting on Thursday with the woman set to be the new Democrat Speaker of the House of Representatives, Nancy Pelosi, Mr Bush was due to meet the expected new Senate majority leader on Friday. Nevada Senator Harry Reid, 66, has called for co-operation between Republicans and Democrats over the next two years. "It's time for bipartisanship, it's time for open government, transparency, and it's a time for results," he said after the Democratic victory in the Senate was confirmed. Completing unfinished business is the priority for the outgoing Congress in the final few weeks before it dissolves, both parties have agreed. Congress still has outstanding legislation to pass, including tax-relief measures and spending bills. The Senate also needs to confirm a new defence secretary. "That means the next few weeks are going to be busy ones," Mr Bush said on Thursday.